The legend could use some work. Why are they boxes? There's no option to pick a team. 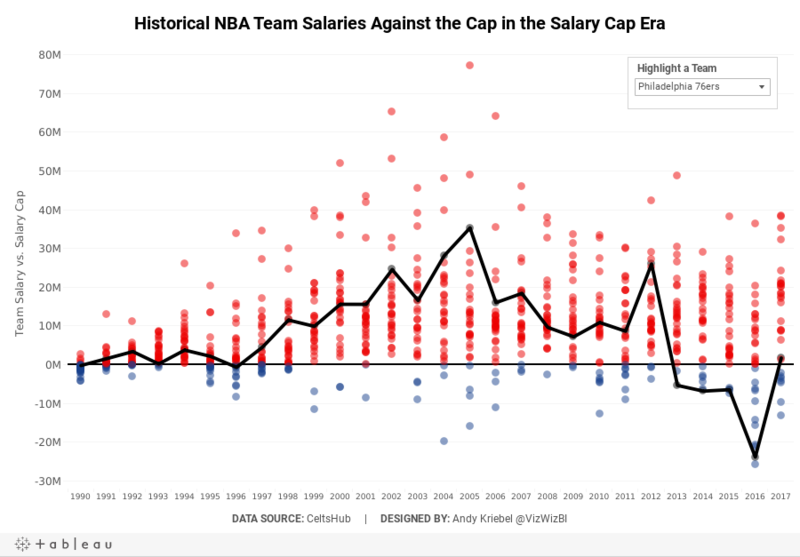 What if I want to know my favorite team's salary vs. the salary cap? I wanted to show all teams so that they could be compared. I settled on a dot plot for each season. I created a calculation to get the starting year for each season so that the x-axis labels would look nicer and could be displayed horizontally. I made the focus on the variance to the salary cap. I had no idea so many teams were over the salary cap. I included a line that displays the NBA average of the variance to the cap for the team selected (via a parameter). Since teams have moved to other cities and changed names, I created a calculation to make them franchises. To understand how many outliers there were, I used box plots and hid the marks behind the boxes. The problem I saw with this, though, was that I didn't feel like I had much context for the distribution of the teams, even though that it the point of a box plot. I decided to scrap the box plot and created this version in the end.